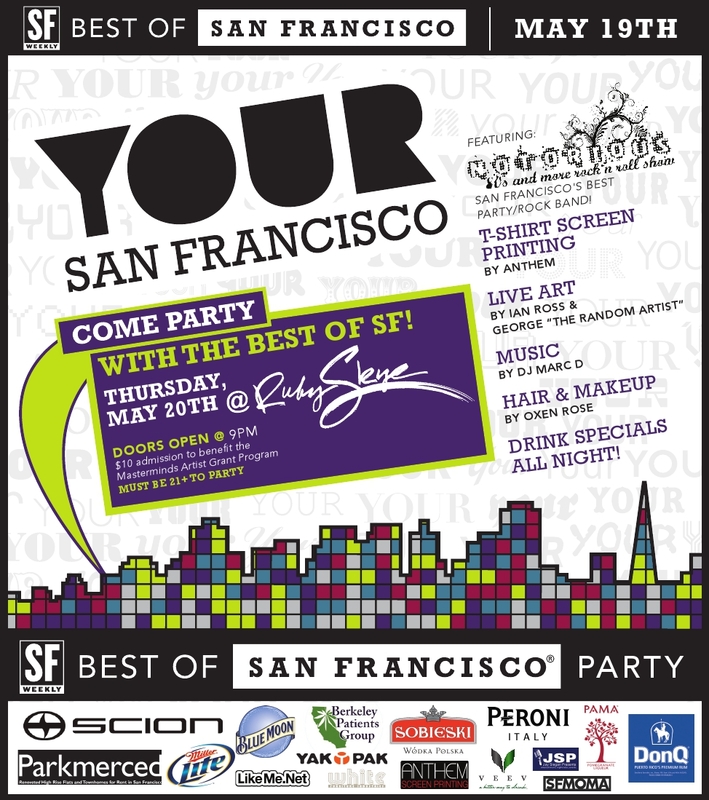 This is SF Weekly’s most important event as it celebrates the Best that San Francisco has to offer. From food to shopping, our biggest issue of the year runs the gamut on covering everything via the Reader’s Poll and the Editor’s Picks. To follow this massive issue is a massive party, which is held every year at Ruby Skye, the premier nightclub of San Francisco. 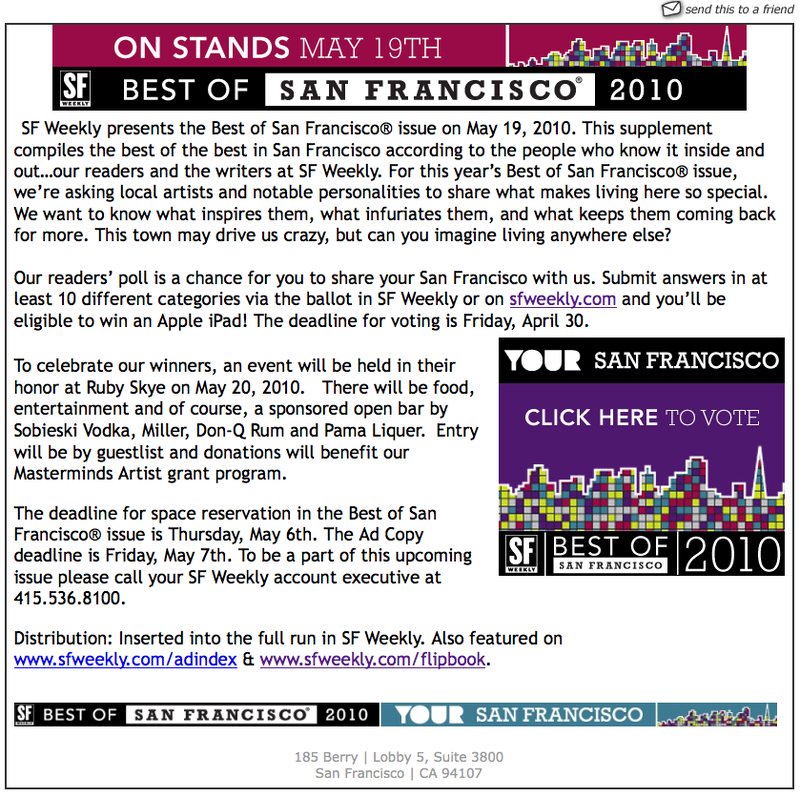 The first thing that had to be done before this event could even happen was to get the public to vote on the Reader’s Poll. 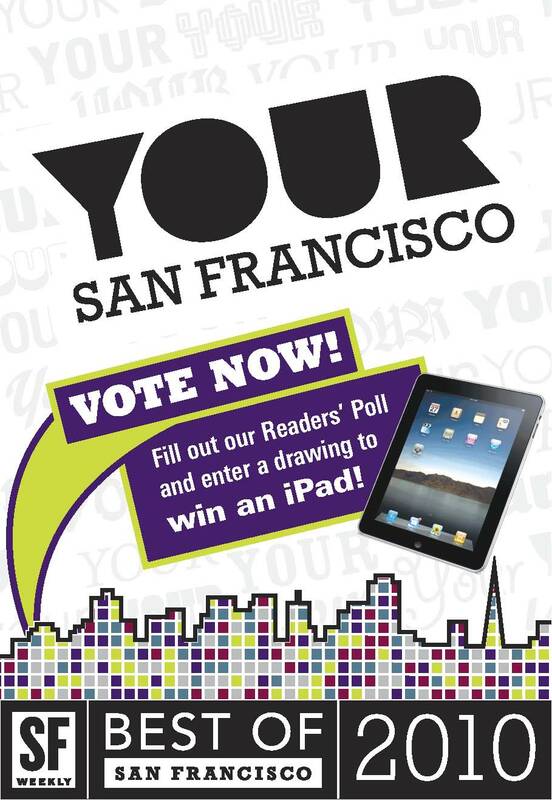 We encouraged people to vote by having a contest: The top voter would win an Apple iPad! Once the poll closed, and the winner awarded her brand new iPad it was on to planning and promoting the party. I had to hire a band to play, which I was able to do on trade, along with helping to pick the VIP food menu, creating the sponsor/winner slide show, getting items and stuffing the Yak-Pak gift bags for guests and setting up each of the sponsors in their rightful place within Ruby Skye. Although a big venue, I had to be strategic in where some sponsors such as ANTHEM t-shirt screen printers, Oxen Rose Salon’s stylists and makeup artists, White Furniture’s contemporary lounge, both of the live artists who were going to paint on-site during the party and Scion’s photo booth would go as they required more than a table, so certain space requirements had to be arranged. To promote, I ran print and online ads along with multiple postings on various social media websites. The party went great with the Ruby Skye staff being extremely easy to work with. Made my life so much easier! Guests enjoyed the band, were dancing, checking out the live-art, putting on the free t-shirts and more. Guests also received Yak-Pak gift bags as they left the party which they were very excited to receive.